This year's PPEH undergraduate fellows represent a range of scholarly fields, modes of inquiry, and creative practices. Together, they have reflected on their ideas surrounding the concept of the "Anthropocene." In particular, they responded to the following prompt: How has recognition of the Anthropocene influenced your thinking about your trajectory in terms of research, scholarship, career, life? This is the second in a series of three posts regarding the Fellows' own thinking and critical pursuits within a moment of profound human imprint on our environment. I have never experienced a sense of urgency such like the one I am experiencing now. The Anthropocene comes with large-scale problems, including human-induced climate change, mass extinction of animals, use of finite resources at an alarming rate, and drastic altering of the natural landscape. The Anthropocene encourages me to personally reflect on this scale and how my everyday actions contribute to these challenges. At times, I am unsure how significant my small actions are in this moment - how recycling coffee cups or carpooling minimizes the impact I have on the Earth. However, my research may suggest that small actions are just what we need to begin reversing the impact humans have made on the Earth. With the Anthropocene in mind, my research is tailored towards reducing waste of natural resources. I use microscopic bacteria to tackle a very macroscopic problem: asbestos toxicity to humans. Asbestos is a natural, fibrous mineral that comes from rock and soil. While asbestos has been around long before humans, it was later mined for use in the automobile and construction industries. The material is largely linked with industrialization, and as it spread into homes and cars, its dangers to human health have become apparent. Dangerous attempt at asbestos removal. Disturbance of asbestos results in toxic flaking. The problem with asbestos is its physical and chemical properties. 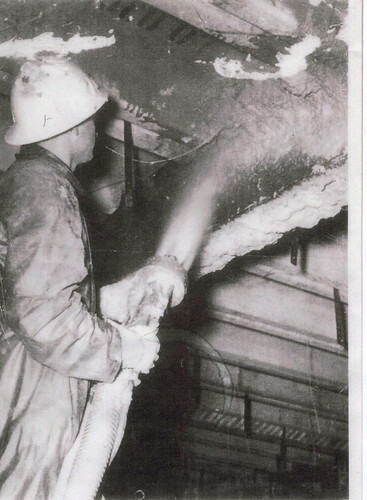 Asbestos breaks and flakes into microscopic shards, which if inhaled can puncture and scar cells in the lungs. Iron ions in asbestos' crystal structure can generate free-radicals in cells. Free-radicals can cause cells to mutate, leading to cancer. As part of the Penn Geomicrobiology Lab, I research the application of chemosynthetic bacteria for bioremediation of the physical and chemical hazards of asbestos. Bioremediation refers to the use of the unique metabolisms of bacteria to, in essence, digest the silica backbone responsible for flaking, and the iron responsible for free-radicalizing. These specific microbes are metabolically versatile. In past experiments, it was found that they have the remarkable ability to remove minerals from hydrothermal vents on the ocean floor, and they are now also used to mine metals from e-waste and clean oil spills in the ocean. After they remove these materials, bacteria can incorporate the extracted minerals into a sticky biofilm. We are hoping to use this bacteria to complete the same task with asbestos. Along with reduced flaking, which could have great benefits toward improving human health, this process could preserve a large amount of asbestos. Asbestos continues to be an integral part of the automobile and construction industries, due to its excellent mineral properties of high tensile strength, thermal insulation, and non-flammability [2, 3]. Rather than waste these important properties, it is possible to use them as a secondary industrial product - recycling these materials through this work of scientists and these bacteria. My research “domesticating” bacteria to remediate a problem for human health and the environment goes hand-in-hand with my studies in geology and pre-medicine. Wherever my research and education takes me, I want to educate people about the innovative ways we can recycle and reuse resources. Instead of large-scale destruction, I want to see large-scale preservation, reminding people that change can literally start small. Sometimes, as in my research, it takes microscopic steps. 1. Vetriani, C., Speck, M. D., Ellor, S. V., Lutz, R. A., & Starovoytov, V., Thermovibrio ammonificans sp. nov., a thermophilic, chemolithotrophic, nitrate-ammonifying bacterium from deep-sea hydrothermal vents. International Journal of Systematic and Evolutionary Microbiology, 2004, 54: p. 175-181. 3. Gaggero, L., et al., Self-sustained combustion synthesis and asbestos-bearing waste: Scaling up from laboratory towards pre-industrial size plant. Energy Proced., 2016, 97: p. 515-22. I am often quite frustrated with the name "Anthropocene." It’s something we can choose to live with quietly but that should really shake us and say: Look at the mess you’ve made. Flattening the present into this one word is problematic because the name does not (and perhaps cannot) adequately define our lived reality. I go to work, read books for class, stand in line at the supermarket, fight and make up with friends and family. How can I possibly be worried about the fate of the species on top of all that? Where do I end and where does the collective “we” begin? Naming the current geological age also makes it easier to conflate the moment with the things going on around us. Each morning I look out my window at the Philadelphia oil refinery and see proof of the Anthropocene, but when I step out into the 70-degree February weather two days after it snowed, I feel the effects of climate change. The one pretty obviously caused the other, but it’s getting increasingly difficult to disentangle the moment from the manifestation, making it no wonder that environmental discourse is so cantankerous and politically fraught. So I’ll just come out and say it: The name Anthropocene doesn’t mean anything to me, and it shouldn’t to you, either. It probably does more harm than good. Calling “now” the Age of the Human (A.) reinforces our species solipsism and (B.) sets us against a ticking clock. All geological periods undoubtedly end, but when and how will our end come? What I mean to say is that, being emplaced in the Anthropocene makes it hard to look out at the surrounding world, and in so doing creates a sense of helplessness: It would be easy to watch the slow violence of climate change from the sidelines, though really what we need is to mobilize publics and promote meaningful, remedial action. I wish we would spend less time debating what to call the present (Capitalocene, Chthulucene, Misanthropocene) and more time affecting actual change.